I love the uniforms for the 3-year-olds: the jerseys go to their knees, the shorts go to their ankles, and the socks go their bellies. 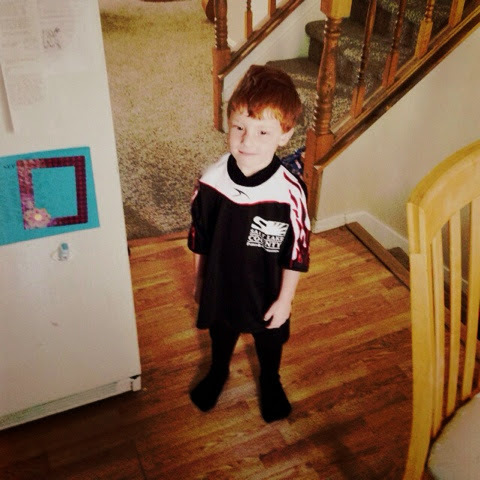 After sitting through six seasons of his big brother's soccer games, it's finally time for Tate to get a chance. We start with some stretching which, at this age, just means touching toes and jumping up and down. A few kids follow along; most just stare at me blankly. A few kids cry. The game starts and it takes a few more minutes and some prodding before the kids realize they need to kick the ball. It takes about just as long for about a third of the kids to start crying. By half-time, about half the kids are crying. After half-time, instead of leaving a few kids on the sideline, I bring them all in, realizing that attrition will quickly take its toll as kids decide they're thirsty or hungry or they want to play with their little brother or pet their dog. Throughout the entire second half, a little girl cries and tells me she just wants to go the playground; I tell her that her mom will totally take her after the game. And then the game ends and it feels like we've narrowly survived the battle. But then something magical happens. Somehow, a lukewarm Capri Sun and a bag of smiley face fruit snacks makes it all worth it. And we live to fight another day.